This Pulled Chicken Sandwich makes for an easy and delicious dinner that everyone will love. Tender chicken breast rubbed in spices then slow roasted, served on a toasted bun with barbecue sauce and coleslaw. Does it get any better? I’ve been craving a pulled pork sandwich lately, this happens a lot. But instead of pork, I made my pulled pork sandwich recipe using chicken breasts instead of pork which is much faster, but just as good. The chicken roasts for 1 hour, the pork for 6. The key to keeping the chicken moist is roasting it in chicken stock mixed with barbecue sauce (of which I make my own, you can get my easy recipe here) because chicken breasts can tend to dry but any of your favorite will work fine. What is a pulled chicken sandwich without coleslaw? I’ve got you covered on that also with my crunchy vegetable coleslaw, because this sandwich has to have the crunch and creaminess of coleslaw. These are the components that make up the perfect pulled chicken/pork sandwich for me. And now that I’ve made myself hungry and craving this all over again, I’m off to make my grocery list so I can make this for dinner. 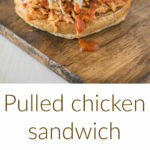 If you’ve tried this Pulled Chicken Sandwich or any other recipe on the blog then don’t forget to rate the recipe and let me know how you got on in the comments below. I love to hear from my readers! You can also FOLLOW ME on FACEBOOK, TWITTER, INSTAGRAMand PINTEREST to see daily recipe updates. 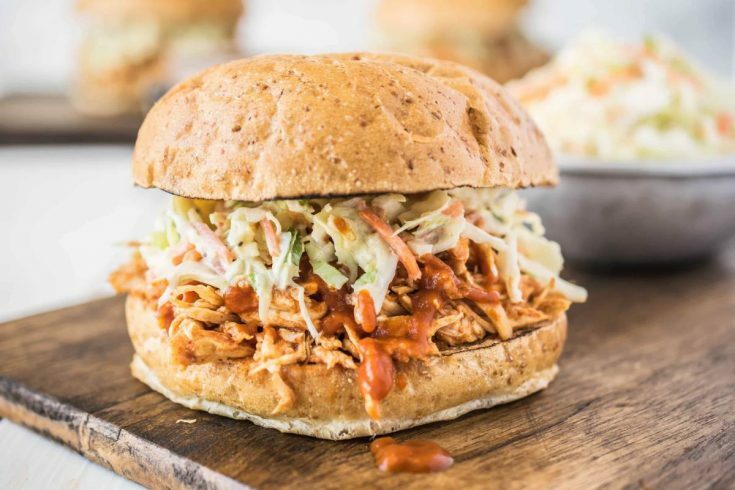 Tender chicken breasts slow roasted in spices and served on a bun with bbq sauce and coleslaw. Add the smoked paprika, mustard powder, mustard powder, onion powder, garlic powder, salt and pepper, mix well. Add the chicken breasts to a roasting pan and rub well with the spice blend until they are all completely covered. Cover and refrigerate 1 hour to overnight. 1 hour prior to roasting, remove the chicken from the refrigerator and allow to come to room temperature while preheating oven to 300 degrees. Mix the chicken stock with 1/4 cup of barbecue sauce and pour the bottom of the baking dish. Add the chicken breasts, coating with the sauce and cover tightly with foil. Roast for 1 hour, then remove the foil. Turn over the chicken breasts and continue to roast for 30 minutes more. After removing from the oven, remove the chicken from the pan. Pour some of the liquid out of the pan and reserve about 1 cup in the roasting pan. Stir in 1 cup of the barbecue sauce, then add the chicken back into the pan. Using 2 forks, going with the grain, shred the chicken mixing with the sauce as you go. Serve warm on toasted buns and extra sauce. I just made this for a small memorial day gathering and it was a big hit! It was super easy too! Thanks for a great recipe! I’m so happy to hear this. Thank you for sharing with me Mariah. Pulled chicken is on my menu for dinner this week and after seeing your photos, I can’t wait! Your sandwiches look absolutely perfect, filled with all that chicken and beautiful coleslaw! I’m drooling over here! This sandwich looks wonderful!! Seems to be so easy to put together and everyone in my family will love this. Oh my gosh this looks absolutely amazing! Loving that BBQ sauce shot too! We went to a pool party over the weekend, and my husband wanted to make BBQ chicken sammies. We were just going to use bottled sauce, so your recipe is way better! I think I’ll save this for the next time he talks about it because this is so beautiful, and I know it’d be a hit at the party!